'Among the Living' was a national touring project that came out of the studio in the summer of 2007. The core of the project was a series of ten limited edition skateboards, each designed by a different artist. The artists were Ross Sinclair, David Burrows, Mark Beasley and Stuart Bailey, Gordon Dalton, Craig Fisher, Juneau Projects, Bedwyr Williams, Kate Parrott, Beagles and Ramsay, and Lucienne Cole. 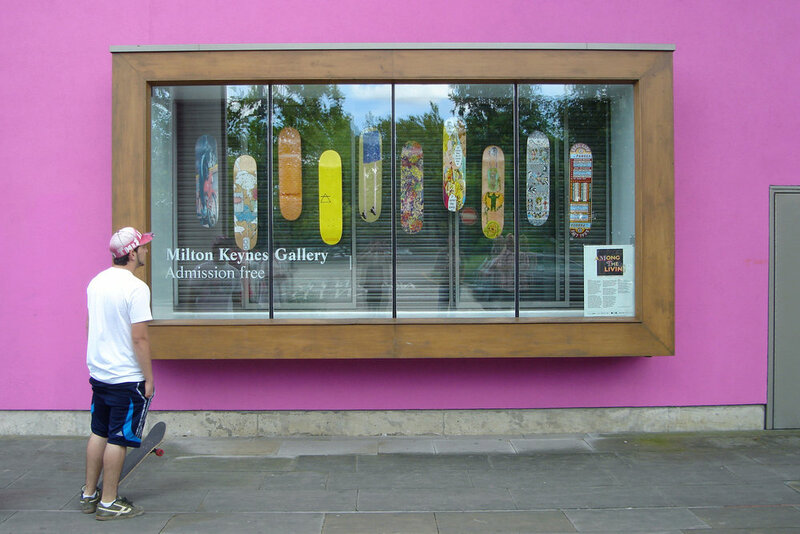 The decks could be bought through the project's gallery partners, or won at a series of live skate jam events that happened around the UK. The project launched with an exhibition of the decks at the ICA (London) and then toured, in partnership with Milton Keynes Gallery, The City Gallery (Leicester), Chapter (Cardiff) and mima (Middlesbrough). Alongside the decks a newspaper/zine was commissioned, which saw Dave Bevan tour with the project, documenting everything as it went along. A PDF of the newspaper can be downloaded here. There were also two gallery commissions by Ross Sinclair (at Chapter) and Juneau Projects (at mima), along with a video commission that also acted as documentation, by LA-based filmmaker, Damon Packard. The video can be seen below.